What makes it special: Caprice was produced by Chevrolet for the 1965 to 1996 model years. It was the most popular American car in the sixties and early seventies. 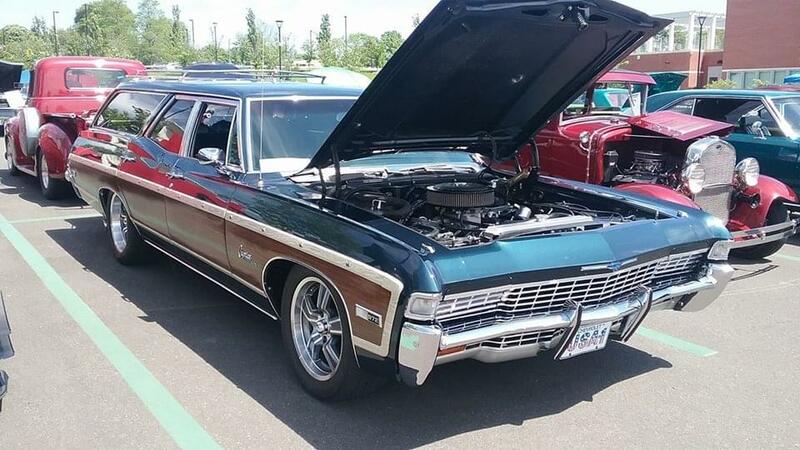 Introduced in mid-1965 as a luxury trim package for the Impala four-door hardtop, Chevrolet offered a full line of Caprice models for the 1966 and subsequent model years, including a “formal hardtop” coupe and an Estate station wagon. What made it famous: The 1968 Caprice received a minor facelift that included a new grille with taillights set into the bumper and optional hidden headlamps. Side marker lamps became standard on all U.S. cars and the Caprice carried over the optional white corner marker lamps at the forward edge of the fenders in addition to the amber parking lamps which were illuminated with the headlights. All 1968 Chevrolets got front side marker lamps on the fender; cars with an optional engine were identified with its cubic inch displacement listed on half the bezel; the lamp itself occupied the other half. The fiber optics monitoring system was offered again as an option. The L72 427 cu in 425 hp Turbo-Jet V8 returned to the option list after a one-year hiatus. A new 307 cu in Turbo Fire V8 rated at 200 hp replaced the 195 hp 283 cu in small block as the standard engine. Inside, the instrument panel was revised with a return to the horizontal sweep speedometer and a revised three-spoke steering wheel. An optional instrument cluster had a narrow speedometer within its opening and flanking it with engine-turned instruments in the place of warning lamps. The fuel gauge, placed next to the speedometer within its own pod in the base models, was moved to its new place next to the speedometer. A tachometer took the place of the fuel gauge in the large opening left by the fuel gauge. Why I would want one: Love wagons! They remind me of growing up and taking road trips. They also are enjoying huge popularity as street rods, customs and “Surfer” rides. Fun fact: Full-size Chevrolet sales peaked in 1965 with over a million sold.